Set against a background of clouds, the International Space Station is featured in this image photographed by an STS-129 crew member on Atlantis soon after the station and shuttle undocked on Nov. 25, 2009. TheInternational Space Station won?t have to fire its thrusters Saturday to avoida close call with part of a spent rocket that launched a comet probe 10 yearsago, NASA officials said. NASA?sMission Control center in Houston spent Friday tracking the piece of a defunctDelta 2 rocket that launched the agency?s Stardust probe toward the cometWild 2 (pronounced ?Vilt 2?) in 1999,?ultimately finding that it willpass well clear of the station when it zooms by. The debrisis now expected to pass within about 5 1/2 miles (9 km) of the station, nearlytwice as far away as initially thought, during its closest approach Saturday at6:05 p.m. EST (2305 GMT). It is steadily moving away from the space station and poses no threat, NASAofficials said. In itsformer life, thespace debris formed part of the rocket that launched NASA?s Stardustmission toward a 2004 rendezvous with Comet Wild 2. The probe?s samplecanister collected bits of the distant comet and returned them to Earth in 2006. TheStardust carrier ship, now calledStardust-NExT - is currently headed to a different comet called Tempel 1.NASA?s Deep Impact probe intentionally crashed a probe into Tempel 1 in 2005 tostudy its interior. Stardust-NExT is designed to revisit the comet in February2011 to see how it has changed. Anotherpiece of space trash, the remains of an old experiment that hitchhiked to orbiton a larger vehicle, is also expected to swing by the space station on Monday.But that debris will miss the space station by a comfortable 8.6 miles (14 km)and also poses no threat to the orbiting laboratory. NASA had hopedthe space station wouldn?t have to dodge the space junk since it would have complicatedand already busy time at theorbiting laboratory. A RussianSoyuz spacecraft is due to depart the space station next week to return threemembers of the outpost?s five-man crew back to Earth on Dec. 1. A week later,a disposable engine module that ferried a new Russian room to the station this monthis also due to cast off from the station, with another Soyuz carrying threemore astronauts poised to launch toward the orbiting lab on Dec. 22. 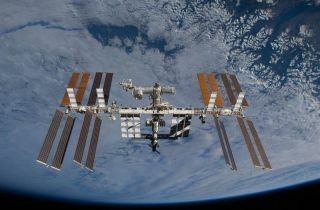 Moving thespace station Saturday would have impacted the timing for the Soyuz flights toand from the station, said NASA space operations chief Bill Gerstenmaier onFriday. He spoke at NASA?s Kennedy Space Center in Florida, where just hoursearlier theshuttle Atlantis landed to end its own 11-day flight to deliver about27,250 pounds (12,360 kg) of spare parts to the station. ?We have tobe careful how we go about maneuvering the space station,? Gerstenmaier said. "Wehave to balance the landing, the other Soyuz launch and then make sure we?vetweaked it enough that we miss the object.? NASA typicallymoves the station when the odds of a space debris impact are within a1-in-10,000 chance. Mission Control also works to keep a safety perimeter that extends15 miles (25 km) around the space station, as well as about a half-mile (0.75km) above and below it. The stationflies in an orbit about 220 miles (354 km) above Earth at a speed of about17,500 mph (28,163 kph). Spacedebris has been a recurring concern for the space station and other spacecraft,especially since the crash of two communications satellites earlier this yearand China?s intentional destruction of a satellite in 2007 during an anti-satellitetest. The growingthreat of space junk to orbital vehicles has sparked a renewed push to bettermonitor, and possibly reduce, the more than 20,000 pieces of space junkcurrently watched by tracking agencies.